The Dirty Sock 10K was held today, but I opted to go solo with a run on the north end of the Bethpage trail. 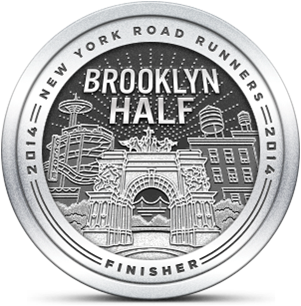 Last weekend the Runsketeers owned that route, so it would have been redundant to return for the race. Besides that, today's weather was fairly unpleasant for running. Garmin said the "feels like" temperature was 83° with 62% humidity. If it was that hot and humid on the bike trail this morning, the Dirty Sock course must surely have been oppressive. I didn't feel like doing another neighborhood run, so I headed to Bethpage with no particular plan except to start on Colonial Road. After a mental coin toss, I chose to go north as far as the Washington Ave overpass, that would get me about five miles out and back. It was the usual mix of walkers, runners and cyclists on the trail, although I did see a guy on an ElliptiGO about halfway through. I carried an 8 oz. bottle of spring water that quickly warmed to body temperature in my hand. I was concerned about dehydration, so I continued to drink from it even though it provided no refreshment. Later in the day, I looked at insulated running hydration bottles in a couple of stores, but I'm always underwhelmed with what I find in stores. I've been frustrated with my expensive Ultimate Direction bottle that, up until today, refused to give up any water no matter how hard I squeezed it or chomped on the bite valve. I challenged my kids to figure out the problem this afternoon and of course they did. 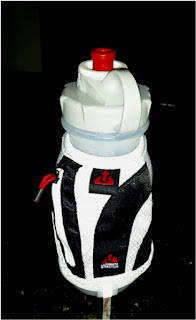 So now I have a great, insulated 21 ounce bottle to take with me on my next long run. My five miles went by fairly quickly, probably because I know the path so well I know exactly what's left to cover at any time. I don't need to go into the office tomorrow and I'm hoping to demonstrate some discipline and get out early before the heat comes. Is it time to return to the track for some speed enabling repeats? Probably. Will I? Maybe. "Formally" stingy? Like while in a tuxedo? I've seen that ElliptiGo guy! Yes, black tie only. No tipping the waiters. I mean waters - Ha! I really wonder how that guy gets that ElliptiGO up some of the big hills. I really wonder what it feels like to be a spectacle. He likes being the center of attention, obviously. He ignored me when I waved, so he's either in his own world or a jerk.